This is a U.S.-based program aimed at helping students improve English language skills, while learning about selected economic, political, historical, geographical and social aspects of the United States. 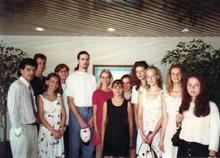 Since 1985, ILI has run career and leadership development programs for American university students (Travel-and-Learn) and European young people (AELIP, Operation Takeoff: USA and Your Career Passport). Programs have been based in the Czech Republic, Switzerland, Austria and Germany, as well as in the U. S. in Florida, New York, New Jersey, Tennessee, Colorado and Wyoming. In all these programs, the Institute has challenged young people to broaden their horizons geographically and culturally, to open their minds to new attitudes and insights, and to accomplish the dreams and vision they have for their own lives.